Washington, DC Metro Station on a cold January morning in 2007. The man with a violin played six Bach pieces for about 45 minutes. During that time approximately. 2 thousand people went through the station, most of them on their way to work. 1 hour: He finished playing and silence took over. No one applauded. 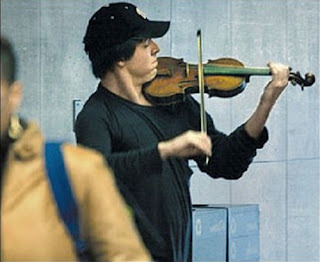 No one knew this, but the violinist was Joshua Bell, an American Grammy award winning vioinist and one of the greatest musicians in the world. He played one of the most intricate pieces ever written, with a violin worth $3.5 million dollars. Two days before Joshua Bell sold out a theater in Boston where the seats averaged $100. I’m Azlina from Universiti Sains Malaysia, Penang. I am currently doing a research on Malaysian Bloggers as part of my Masters degree in Social Science (Psychology). Your blog has been selected and I would sincerely be grateful if you can participate in my study. In this research, I am interested to understand more about your blogging experience. If you are indeed 18 years old and above, and willing to spend a few moments of your time to complete a survey to help with my research, please answer the questionnaire in the link below as soon as possible. If you have any questions or concerns about this survey, you may email me at scorpluto35@yahoo.com. I sincerely appreciate your time and consideration!